Love locks or love padlocks have been around a long time, some even say as far back as World War II in Serbia. But for sure it has been seen in different parts of Europe since year 2000. Now it has spread all over the world. 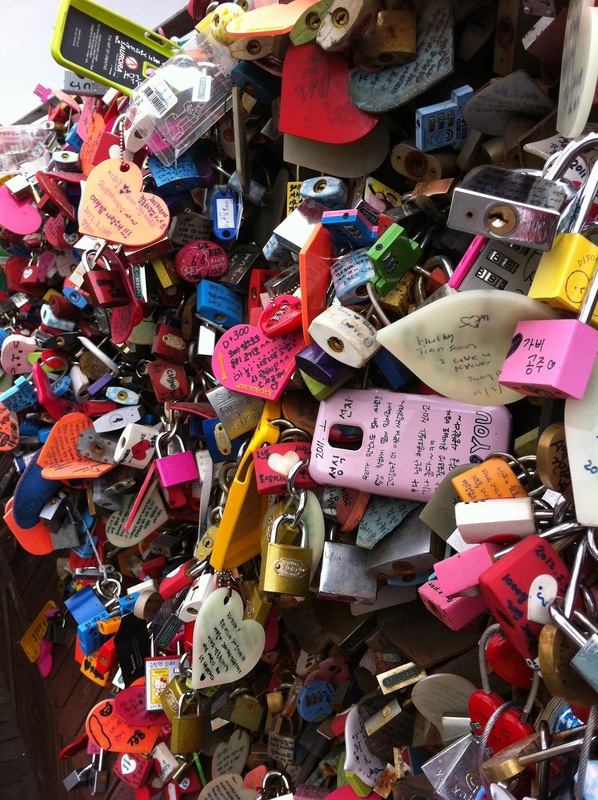 Love locks can be seen in Japan, Taiwan, Italy, France, Uruguay, South Korea and others. Simply put, these are padlocks locked in public places like fences, bridges, even trees. What makes this special, specifically to couples is that you write your name, your partner’s and your messages for each other on these locks as a pledge or public declaration of love. No magic. No assurance of longevity. Just a mere symbol of a couple’s affection for one another. Since South Korea is one of the most romantic countries in the world, what with their many Korean dramas, it’s not surprising to see such display of love at Seoul’s symbol, the N SEOUL TOWER. On the 2nd floor viewing deck, the wire fence enclosing the area is almost full of these love locks as well as the man made trees on the 1st floor. But padlocks are not the only ones found there. Some couples were more creative using bike locks, cellphone cases, keychains, plastic hearts and even paper in place of the usual. Just for fun, I joined the crowd. Cute padlocks were available at the N Seoul gift shop for tourists like myself. And at 11,500 won or about $11.00 for partner locks they were pretty overpriced (NOTE TO SELF: bring own padlocks next time). Buyers are warned not to throw away the keys off the N Seoul as it might, and will, cause injuries. So they put a key drop box in the shop for recycling. I decided to keep mine as souvenir. Me and my Love locks......Hello Forever! So now locked on the 2nd floor viewing deck are padlocks declaring my love for my husband and his for me (since he wasn’t there with me, I pledged on his behalf….ahhhh I love being a wife of ten happy years….). I know that a few years or even a few months from now, my locks would look battered and rusted by the elements or even hidden under other locks. But I feel good knowing that along with thousands of other couples, I have left my mark in Seoul.